Uganda's Mugisha Muntu, Bobi Wine Alliance Plan In The Pipeline? Who is Major General Mugisha Muntu? 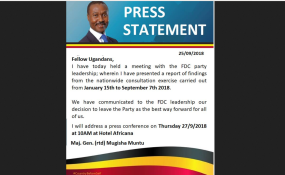 In dramatic fashion at about 3pm, Mugisha Muntu's handlers prematurely announced the major general had left FDC, a party he led strenuously from 2012 to 2017. In the days before the announcement came, speculation swirled that Muntu planned to rally his base and join forces with the People Power Movement poster boy and new kid on the political block, Robert Kyagulanyi (Bobi Wine), the MP for Kyadondo East. Muntu and Kyagulanyi's groups reportedly met on Tuesday to agree on a working engagement. The meeting, a source close to the two groups said, was requested by Muntu who reportedly called Kyagulanyi and his lawyer Asuman Basalirwa by telephone. Sources with knowledge of the plan said Muntu views Bobi Wine as a powerful political force without a political party bureaucracy, which makes him easy to work with. Previously, Muntu has said in interviews that he is open to working with Bobi Wine. On August 27, Muntu was one of sureties for Kyagulanyi at the High court in Gulu where he was charged with treason alongside 33 others. Addressing his maiden press conference since his return from the USA where he had gone for specialized treatment, Kyagulanyi told journalists at his home in Magere, Wakiso district on Monday that he was not in a hurry to work under any formal structures. "The regime is so desperate; they want us to operate in a way they understand. Some of them have actually reached out to some of my colleagues advising us to establish ourselves as a political party; they want us to shape in a way that is easy for them to handle," Kyagulanyi said. Some insiders this writer interviewed said they are shunning formal structures deliberately. "It is deliberate to remain amorphous because right now you can't know who calls the shots, but once you give in and form structures, you'll be giving yourselves away to the dictator. Dictators work through structures; when you hurry to institutionalize, he will infiltrate you and break you up," the source said. This explains why last week, lawyers Basalirwa, Nicholas Opiyo and Andrew Karamagi became the face of preparations for Bobi's return. Bobi Wine, however, is known to be quietly working with a number of politicians, some of whom have advised him to consider an alliance with Muntu's group. "In a situation where the state is interested in your structures, we felt that it is better to work with a formed coalition. Mugisha Muntu is working towards having an alliance, we have thus advised Bobi to wait for what Muntu is working on," a source said. At the press conference, Kyagulanyi did not rule out the possibility of entering a political alliance but also hinted at the possibility of forming a political organization. "People Power is not Bobi Wine. It is not about me or anyone else. People Power is not a political organization- at least not now," Kyagulanyi said. He said the People Power movement is an idea premised on Article 1 of the Constitution of Uganda. "It is the idea that all power belongs to the people as guaranteed by Article 1 of our Constitution," Kyagulanyi said. Kyagulanyi's people power movement is however wary of some politicians who have identified with it but could have sinister motives. Some can't be trusted and yet they cannot be pushed away. "There are those politicians that have a history of double dealing whom you can't trust but you have to work with them but cautiously," one Kyagulanyi strategists said.